Back in the early 2000\'s two growers from the UK moved to Spain to perfect their breeding and growing techniques. These two guys already had plenty of experience from their teenage years, when they brought back classic cannabis strains from their trips to Holland. In Spain the perfected the art of growing and breeding new varieties with the focus on creating super vast growing times. 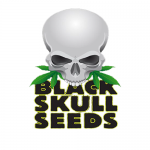 You can now find these specialties under the name of Black Skull Seeds. They\'ve been working hard for the past 10 years an created a selection of 7 FEMINIZED and 6 AUTO strains that are clearly some of the best varieties you can find on the market these days! All their photoperiod strains finish in 7-8 weeks, while still producing a very competitive yield, incredible taste and potency.